A BBC Micro expansion unit, for the BBC Micro is one of a number of peripherals in a box with the same profile and styling as the main computer. The second processors are connected to Acorn's proprietary and trademarked Tube interface. Only one second processor could be connected at a time. The terminology of second processor was slightly misleading, since connected and switched on, the system worked on a "host-parasite" model, with the processor in the external unit taking control while the 6502 in the "main" computer simply took on responsibility for I/O. The 6502 Second Processor (using a 65C02) was clocked at 3 MHz, a full 50% faster than the 6502 inside a BBC Model B, and also had 64 KB of RAM, of which typically 30–44 KB was free for application data (compared to as little as 8½ KB on an unexpanded Model B in graphics mode, or even less with the disc interface). A version of BBC BASIC II, called Hi-BASIC, was produced on ROM for this processor, and Hi versions of View, WordWise and Intersheet were also produced. Various CAD programs were able to take advantage of the 65C02 Second Processor, as was the second processor-specific version of Elite. The Z80 Second Processor required the floppy disc upgrade: it was aimed at business and enabled the BBC system to run CP/M programs. It came with a suite of software that included the COBOL programming language. It ran at 6 MHz and had 64 KB of RAM. A sophisticated second processor sometimes branded as "Acorn Cambridge Co-Processor" with an Acorn logo, and sometimes as "BBC Microcomputer System 32016 Second Processor" along with the BBC Micro's owl logo. The device uses the National Semiconductor 32016 CPU and National Semiconductor 32081 FPU running at 6 MHz. It runs the non-graphical Panos operating system. Various programming languages are available including C, FORTRAN, Lisp, and Pascal, in addition to a version of BBC BASIC. The processor comes with 1 MB of RAM as standard. The processor is also inside the Acorn Cambridge Workstation this time using 10 MHz parts and 4 MB of RAM, sold as part of the Acorn Business Computer line. The Universal Second Processor Unit was an adapter for BBC Master internal co-processor boards, to allow them to be used as external co-processors. It comprised a power supply, interface logic and a connector that matched the internal co-processor connector built into the BBC Master main board. This allowed the BBC B and B+ to use the Turbo board (4 MHz 65C102 with 64 KB of RAM) and the Master 512 board (10 MHz 80186 with 512 kKB of RAM), by fitting them into this expansion unit. It also allowed the BBC Master to have two internal co-processor boards connected, only one of which could be enabled through software. In 2006, a new ARM processor board using an ARM7TDMI processor was designed and sold, without an enclosure but able to fit within the original case. 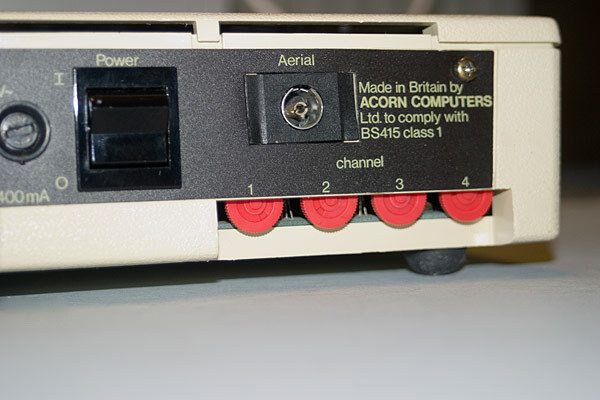 The adapters connected to the BBC Micro's 1 MHz bus interface. Adapters could be daisy-chained, allowing more than one to be fitted. The teletext-like "Mode 7" display mode inside the 8-bit BBC Micros made a broadcast teletext adapter an obvious expansion, and the BBC would broadcast telesoftware free over Ceefax. The hardware and software design was created by Graham Toal. The initial software to use the adapter was quite basic but the BBC decided to rewrite it and produced the Advanced Teletext System. This new ROM added several new features including support for the new Fastext system, which introduced the four coloured buttons subsequently found almost ubiquitously on European remote controls, including the "red button" which remains a feature of digital television broadcasting. The adapter itself was mains powered with its own power switch matching the one on the BBC microcomputer. Connection to the computer was via a ribbon cable and the only other connector on the adapter was a female 75ohm TV aerial (in) connector. The adapter contained four manual tuning wheels to receive signals from four different broadcast channels. Rear view of the adapter. Once tuned, use of the adapter, including switching channels, was controlled via the computer. Teletext pages were displayed on the computer monitor. The Prestel adapter was essentially a modem fitted into the "cheese wedge"-shaped case. It enabled the user to connect to Prestel viewdata services over a telephone line. Allowed the BBC Micro to talk over an IEEE-488 bus to specialised equipment. "Acorn" rather than "BBC" branded. Used to connect two Econet segments together. An Econet bridge is capable of automatically learning a simple network topology and selectively forwarding packets from one LAN segment to the other using a simple routing table based on the contents of the network byte in the Econet packet. The Econet bridge is unique among the cheese wedge expansions, in that it is a stand-alone device that does not require a BBC computer to operate. ^ "Acorn User". Archive.org. Retrieved 2017-02-20. ^ "Sprow's webpages - Internal or external ARM coprocessor". Retrieved 2 March 2019. ^ "Acorn (Was Re: Reading PDP-8 paper tapes)". mdfs.net. This page was last edited on 22 March 2019, at 14:08 (UTC).